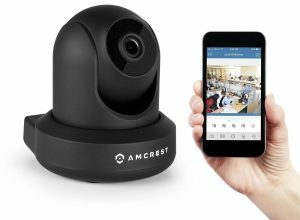 If you want to keep your security needs simple then Amcrest’s IP camera (IP2M-841B) provides a secure (https) wireless camera that allows you to stream your footage across the web or pause and record with the Amcrest App. You can also record direct to the camera if you install a micro SD card. It takes less than 60 seconds according to Amcrest to set up the Wi-fi connectivity and after that you can stream your footage across the web. 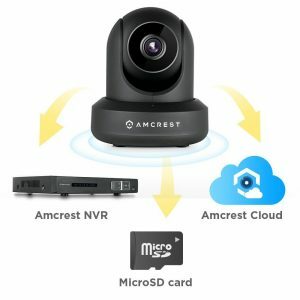 You can stream in real-time and watch recorded video footage with the Amcrest View application. You can upgrade to their cloud service as a free optional extra and receive real-time viewing as well as 4 hrs of video storage space which you can access either on PC, Apple Mac, Smartphone, iPad and any Android device. There is more space available if you purchase one of their plans. Footage can be uploaded via FTP and can be transferred to any Amcrest (or ONVIF compliant) NVR. Each camera offers two-way voice communication, night vision recording, remote pan/tilt controls, a new electronic zoom mechanism, motion detection alerts, e-mail alerts with snapshots, a 90 degree viewing angle, and a choice of recording modes. Your wi-fi data is secured with industry standard SSL/HTTPS encryption with the wireless AES WPA2 security protocol. What is standout with this little IP camera is the 1080p video footage. You receive images with great resoloution and clarity, and to top it all up night vision is also quite good. If you don’t want to shoot in HD, as for example if you want to keep files sizes to a minimum you can lower the video resolution. This is a PTZ camera and the controls work flawlessly (see the reviews below). The speed of the pan and zoom can also be adjusted from slow to fast. The camera also comes with a mounting kit so you can attach it to your ceiling. Although this camera is new on the market, reviews of it has thus far been promising (5* at time of writing). The camera is also protected with a username and password which you can change at any time.